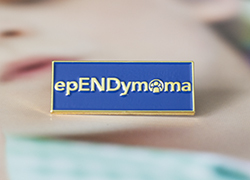 This navy blue lapel pin is 1" x .37" in size with the word epENDymoma featured in gold metal for $25 each. Order and wear yours with pride to help create awareness of this rare disease! Let's END this disease!